The weatherproof LED-HL38 floodlight saves energy while illuminating outdoor signage, architectural details and landscape designs. 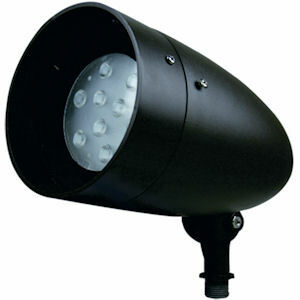 The 16W fixture replaces 100W incandescent lamps, and has a cool white 4700K color temperature with 800 lumens. The bronze-finish, bullet-shaped head is fully adjustable with sure-grip locks. It measures 9 x 5.5 in., and fits standard mounting units.